This is a J&M 291 Performance Series headset. 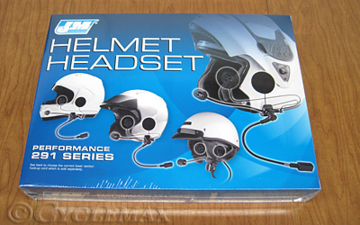 This new model performance 291 series helmet headset from J&M has been designed to be installed into most shorty-style (1/2 shell) helmets with our exclusive slide-in shorty-style mounting system. This is one headset for one helmet only. It features our miniature extra-high-output (XHO) AeroMike® VI boom microphone, (re-tuned for use with all factory installed motorcycle audio systems), new 40mm high-intensity helmet speakers for improved on-highway audio performance, along with our 8-pin two-piece hook-up cord system (upper cord ONLY included with headset) that allows connection of these headsets to any factory installed motorcycle audio system in existence today, including the 1998-2018 Harley Infotainment systems & Honda GL-1800 Premium Audio, just by interchanging the lower section hook-up cord.